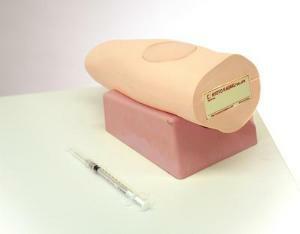 This simulator provides training for intradermal injection to the inner forearm. A clear skin wheal forms when proper injection procedures are followed. The product offers a life-like touch and resistance at the injection site, and the skin can be pulled and punctured as that of a human patient.